See this beautiful child? This is her blog and her familes blog. We talk about her life,her world and the rare coondition that robbed her of everything. This is not a place for you to post por-nography in the comments. Nor is it a place for you to advertise your dirty little businsses. I am sure there are plenty of places to do that other than a disabled little girls blog. I had to delete to of my favorite posts becuase of your pervertedness. You should be ashamed of yourself. I don't know if you are specifically coming here directly or posting through the medical community blog. Either way you must stop or I will find out and I will take legal action against you! 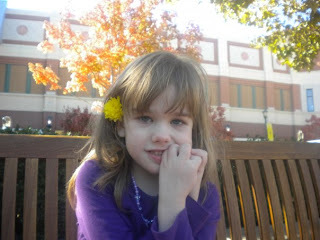 Girl Power 2 Cure is the Charity that I raise money for for Rett Syndrome. Today the founder was featured in Parents and I was amazed to see Abby's picture in the video twice. She works do hard for our girls. I hope you will watch. Go Ingrid! There are days as a caregiver that you just run on autopilot. Wake up,check if she's breathing,check her wound,feed,vent,medicate,lift etc etc etc. There are so many days when I've had 2 hours of sleep,my knees can barely make it up the stairs with her that I wonder why I am being punished. Not by her. Not at all. Why I cannot receive even a small income to take care of my child who cannot speak, use her hands, stand or walk without assistance. She is tube fed and on a very strict schedule. Because I stay home with her, not because I am lazy but because I know that she can receive no better care than from her own mother I am punished. I receive no income. Every quarter my social security statement shows up telling me that I'm not working so I will get less and less once I become 67 or 70. Am I not working? If I absolutely cannot be allowed to be paid to take care of my completely genetically disabled child can we at least put a hold on the amount I would of received when I stopped working? I worked and paid my taxes for decades.. While I'm on this rampage...there are many many states where parents are paid to care for their disabled children. Some have to wait till those children are grown. Others do not. Why arn't the laws and policies the samein every state for every person? We do not live in different countries. Agency's will pay strangers to come in and give me a break and pay them hourly what I got paid overtime at my highest rate. And they are even allowed to take breaks and comb their hair and shower before the job starts. Oh how I would love a congressman or a lawmaker to come an spend a week in my home. There are days like today where I smile at her as she smiles at me and leans in for her 30th tongue kiss of the morning that I wish I could know what she's thinking. Maybe if I stare at her a little harder or hug her a little tighter I can hear her. That little voice trapped behind those sparkling blue eyes and that incredible smile. Mommy your doing a great job. Thanks for always being here. And how do you know the words to every song ever made? During the school year I yell and scream and stomp my feet about how much she knows and how much she is in there and how if the would just give her a chance she could show them. What will she show them? I think they(the educators and therapists) think that I live in this bubble where I think she's doing algebra in her head and planning her first architectural project as soon as she can use her hands. I am not delusional or uneducated. I do not live with my head buried in the sand. Although that would be nice. I would make it pink sand and I would have headphones with nature sounds playing. I am completely aware that with the lack of a treatment or a cure the best I can hope for is for her to be able to click a button or facepoint or eyes gaze at colors,shapes and characters. Weather she is 5 or 45. Will I say that out loud to them? NO! She is so happy. She smiles and sings all day long. If she's not passing out giggles,hugs and kisses there is something very wrong. I wonder if that's just it. She's just happy. I am the coolest thing ever. She looks at me and smiles like a baby would. Is she thinking Mom you are so awesome? You really get me. Or does it not really go beyond I like pink and those are birds? The not knowing is what eats me alive. That and having absolutely no control of anything weather it be right or wrong..I hardly ever cry anymore. I guess that's a start.